Ice cream might just be the perfect summer food. It delights your taste buds while cooling you down on a blistering day. July is National Ice Cream Month, but a month may not be enough time to sample all the ice cream flavors available in the Hudson Valley. 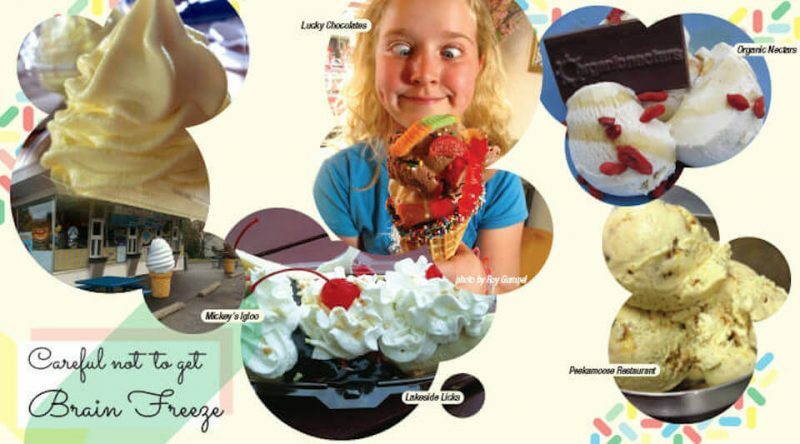 From sorbetto to gelato to soft serve to ice cream cakes, there are several places to sample this tasty treat. A Tavola in New Paltz uses as many local ingredients as possible when making gelato and sorbetto. As a result, many of the flavors are seasonal. Seasonal favorites include strawberry basil sorbetto, grapefruit rosemary sorbetto, Concord grape sorbetto, sweet corn and amaretto gelato, and eggnog gelato. Some of the restaurant’s more obscure flavors include balsamic vinegar gelato, olive oil gelato, and fig ricotta gelato. Their very popular salted caramel is available any time of the year. The restaurant is located at 46 Main Street, New Paltz. Visit atavolany.com or call 845-255-1426. The family-oriented Boice Brothers Ice Cream in midtown Kingston sells cones, shakes, sundaes, banana splits, and parfaits all year long. All the ice cream is made from hormone-free milk from the family dairy, which has been in business since 1914. The stand’s 30 flavors include buzz-worthy coffee, tempting chocolate raspberry, and satisfying mango strawberry. There are nondairy products too. They also sell what many locals insist are the best ice cream cakes in the Hudson Valley. Located at 62 Oneil Street, Kingston, the stand is open from 8am-9pm, seven days a week. For more information, call 845-340-2018. If you still scream for ice cream when you’re done sampling the two soft-serve and 50 hard ice cream flavors Cherries Deli has to offer, you may want to sample a few of the signature sundaes that have become customer favorites. Topping the list is one known as The Excavator, which looks like dirt and mud but tastes delicious. A favorite among kids and adults, the dish is made with chocolate ice cream, chocolate hot fudge, crumbly cookie crunch, whipped cream, and a cherry, of course. The deli is located at 4166 Route 209, Stone Ridge. For more information, call 845-687-9121. Dressel’s Ice Cream Stand in New Paltz serves soft-serve and hard ice cream flavors, routinely creating special dishes with seasonal produce. For example, you can get strawberry sundaes in June, peach sundaes in August and homemade apple crisp a la mode in the fall, all prepared with fruit grown on the Dressel Farm. The farm’s famous strawberry shake sums up the flavor of summer. 271 Route 208, New Paltz. For more information, visit dresselfarms.com/icecream.html or call 845-255-0693. One of the tastiest parts of strolling down Main Street in Phoenicia is a visit to The Ice Cream Station. Open from April through November, the ice cream station serves soft-serve vanilla and chocolate ice cream and vanilla yogurt, plus a weekly special soft-serve ice cream flavor. They also have 36 flavors of hard ice cream and frozen yogurt, and they recently added Greek yogurt. You can top off these fun flavors with sprinkles, candy, and wet toppings. They also carry a large selection of candy, homemade fudge and cold drinks. They are located at 76 Main Street, Phoenicia. For more information, call 845-688-7705. The Cheese Barrel in Margaretville is a gourmet store located in the Catskill Mountains. Stop in for an ice cream cone and grab enough unique candies and delectables to get you through the week. Located at 798 Main Street, Margaretville. Check out cheesebarrel.com or call 845-586-4666. Founded in Phoenicia, Jane’s Ice Cream is available at local restaurants and stores such as Shoprite, Adam’s Fairacre Farms, and Hannaford, as well as New York City’s finest hotels and restaurants, including The Regency, The Carlyle, and The Algonquin. The secret to their success, says co-founder Amy Keller, is that the ice cream is made with fresh, local, organic products and is prepared in small batches with tender loving care. The company has created 80 lip-licking flavors but continues to create new ones. Some of the most popular flavors include Cappuccino Kahlua Calypso and Coconut Almond Joy. This summer’s flavors will include Seed-uction, ice cream made with salted sesame, sunflower and pumpkin seeds; Apricot Orange Flower; and Pomegranate Molasses. To find out where the ice cream is sold, visit janesicecream.com or “like” them on Facebook. The company is now based at 307 Wall Street, Kingston. For more information, call 845-338-1801. Garnish with lime slice and mint leaves. Feel free to substitute the sorbet of your choice. Mango and lemon are also good. Some ice cream stands understand that pets also enjoy frozen treats. Besides serving traditional favorites to their human customers, Lakeside Licks offers icy treats specially made for four-legged friends. For humans, the store offers shakes, malts, and banana splits, as well as over 30 flavors of soft serve. New flavors are added every year. They also offer a variety of specialty sundaes, razzles, and slushies. Lakeside Licks staff will make a specialty sundae or soft-serve flavor combination of your choosing. The family-owned and operated business has locations in Saugerties, Milton and Speculator. The Saugerties location is at 3218 Route 9W South. Hours are 11am-10pm. For more information, visit lakesidelicks.webs.com or their Facebook page. Lazy Crazy Acres in Arkville, just north of Margaretville, whips up what they describe as “cow to cone” gelato. The creamy milk is still steaming when they begin the mix process in their creamery barn. The ice cream is made without artificial colorings, flavorings or corn syrup. Every vanilla bean is hand-scraped and they cook down all the fruits and berries that they source from other small local farms. The creamery’s flavor line up follows the seasons. So, if you fall in love with their Strawberries & Cream, you may have to eat as much as possible during the summer until you can indulge again next year. The ice cream is sold at the Rhinebeck farmer’s market. The creamery is located is 59 Rider Road, Arkville. Visit lazycrazyacres.com or call 845-802-4098. If you love frozen treats but also want to satisfy your candy cravings, Lucky Chocolates is the place to go. The store’s ice cream comes from Ronnybrook Dairy Farm, a third-generation family farm. But the cool thing about this store is the delicious candy you can add to make your ice cream even better. Lucky Chocolates offers 40 kinds of chocolate, and ice cream lovers can mix in or top their cone with truffles, salted caramels, toffee, dark pecans, chocolate turtles, fair-trade chocolate, and more. The store is located at 115 Partition Street, Saugerties. For more information visit luckychocolates.com or call 845-246-7337. On summer nights, if you drive by Mickey’s Igloo ice cream stand, you may see ice cream lovers lined up for a scoop or a shake. As the Kingston fixture has been around for almost 60 years, its fans include old-timers as well as second- and third-generation visitors. The mom and pop operation offers shakes, ice cream sodas, razzles (a blend of soft serve ice cream with toppings mixed in), Baseball Hat and Banana Split Sundaes, plus a Colossal Sundae for those who want a whole lot of ice cream. Flavor Bursts are available in Bubble Gum, Creamsicle, Coffee & Cream, Butter Scotch, Raspberry, Root Beer, Blue Goo, and Strawberry. The four-window stand serves 18 hard ice cream flavors and 25 soft-serve flavors, as well as hot dogs, chicken fingers and onion rings. The original Mickey’s Igloo is located at 416 East Chester Avenue, Kingston but a second store opened at 193 Hurley Avenue, Kingston. Visit mickeysigloo.com or call 845-416-3807 for more info. Organic Nectars offers artisanal frozen desserts that are healthy, environmentally friendly, and delicious. And another plus—there are plenty of flavors for vegans and the lactose intolerant to enjoy. Their Cashewtopia ice cream is free of dairy, soy, refined sugar, gluten, trans fats, and virtually free of saturated fat. The reduced-calorie gourmet treat is made from raw organic cashews and uses agave syrup as a sweetener. Other healthy flavorings made by the Woodstock-based company include raw cacao chocolates, coconut sugar, and goji berries. 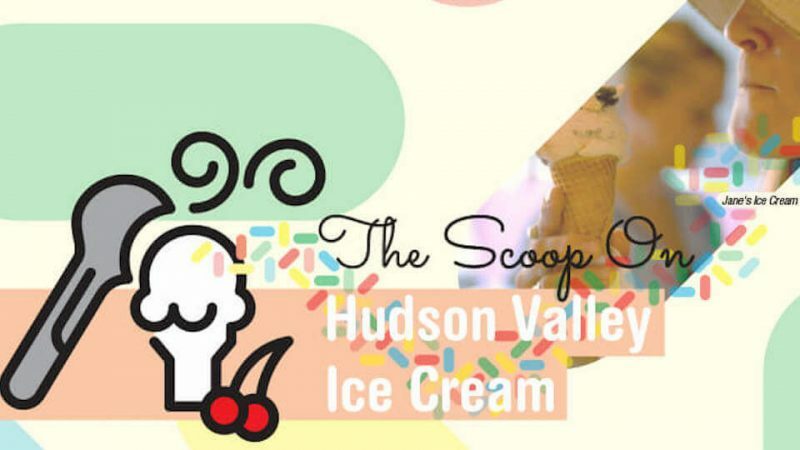 You can buy scoops at Lucky Chocolates in Saugerties, and they also ship door to door. Call 845-246-0506 or check organicnectars.com for more store locations. Peekamoose Restaurant in Big Indian also serves homemade ice cream. It’s insanely popular and insanely decadent! It’s spun daily and is made with natural, local ingredients. They have about seven flavors nightly, which change with the seasons. One of their most sought after flavors—corn on the cob ice cream—is only is only available during the absolute peak season, when the sugar levels are at their highest. No extra sugar is added to this flavor—the natural sweetness of the corn speaks for itself. They are located at 8373 Route 28, Big Indian. For more information call 845-254-6500 or visit peekamooserestaurant.com.